He didn&apos;t think about the baby coyotes who may have lost their Mommie or Daddy. But then, he never has been concerned about the children. Bragging about killing is not the stuff that true men of courage are made of. What about the labrador puppy? You apparently have never had a pet killed by a coyote. Or watched one get killed by a coyote. And wished you had a gun to save your pet. I believe Rick Perry carries a gun when walking in case he encounters a rattlesnake, some people carry sticks to scare them off and some people carry guns to shoot them, and that he shot a coyote that probably would have enjoyed a taste of a Labrador puppy. Probably not legal by the way. He should have said the coyote was about to lunge at part of his security detail. But, well, he&apos;s the governor. 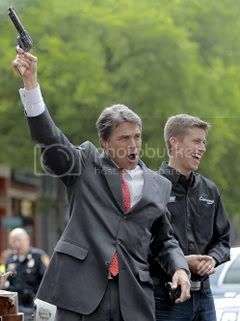 I believe Rick Perry also probably hums “Macho, Macho Man” to himself quite a bit. And that he believes that the Village People were all straight and ex-Marines. And that Sarah Palin and the Palinites are the Lost Tribes of Israel. Whom the rest of us wish would just get lost. George W. Bush never made a huge, big deal about killing anything while clearing brush on his “ranch” in Crawford. Seems to me that he (Perry) is simply trying to downplay the photo of him shooting “blanks.” Too bad he had to tell a story about shooting a coyote that was supposedly lurching toward his daughter&apos;s puppy to give him a better image for some people. Maybe there needs to be a picture of the dead coyote with the governor standing over it triumphantly. Oh, and just today in this morning&apos;s Dallas News… there&apos;s news of a “bull” running wild (Saturday Night) and ramming cars on I30 (between Fort Worth and Dallas) and then being shot dead by the Arlington police after it lunged toward an animal control officer who was trying to shoot it with a tranquilizer gun. There&apos;s a picture of the downed “bull” in the print edition. It doesn&apos;t look like a bull…and it&apos;s a sick story with vivid details of how “the bull” was bloody from ramming cars…to me, it seems strangely coincidental to this “Rick Perry Shoots a Coyote” story. It will surely become fresh fodder just in time for the Monday morning North Texas radio talk shows (Mark Davis). I still can&apos;t find a picture of the “downed bull” online. Seems he would be easy enough to identify…don&apos;t they all have brands to prevent cattle rustling? But can you please stop recycling news articles. I understand you want to hammer home your points, but there&apos;s much more to talk about in this Gov&apos;s race other than a mansions, coyotes,and any other stupid/gossip stuff. But Perry won&apos;t enter into anything but stupid gossip stuff. Definitely much more to talk about, and he won&apos;t even agree to a debate with Bill White. Rick Perry might bring up several matters that Bill White would probably lose the election over. Bill White will bring up matters that Rick Perry will definitely lose the election over. It&apos;s really not an important story and little effort should be put into getting the truth behind it, but a Turkey Buzzard could smell something rotten in his account from as far away as Marfa, TX. And a coyote approaching his dog in the presence of the Governor and a security detail? Unless the coyote was rabid, that just doesn&apos;t sound right. Anyway, this has been my lunchtime distraction of the day. Thanks for reading.